The Station is in the church of St. Susanna, virgin and martyr of Rome. The first Christian place of worship was built here in the 4th century. It was probably the titulus of Pope Caius (283-296). Caius was St. Susanna’s uncle, and tradition claims that the church stands on the site of her martyrdom. We are told that Santa Susanna was the daughter of a learned priest, Gabinus, and niece of Pope St. Caius (or Gaius, 283-296). She was not only beautiful, but charming and highly educated. Diocletian himself sought her through his courtiers and her uncles, Claudius and Maximus, to be the wife of his son-in-law and adopted heir, Maximian. She refused, however, considering herself a bride of Christ, and was sentenced to death – but not before converting Claudius and Maximus to the Faith. Her uncles were burned alive, while she was beheaded privately at home (on the site of this church) in 290 along with her father, St. Gabinus. Soon afterwards, Pope Caius dedicated Gabinus’ home as a public oratory. It became known as the titulus Gabini ad duas domos, one of the original twenty-five parishes of Rome. This oratory was enlarged by Sergius I (687-701) and redecorated in the sixteenth century with vast Renaissance frescoes, depicting principally the story of the biblical Susanna, the Jewish woman who was the victim of false charges of impurity but saved by Daniel. 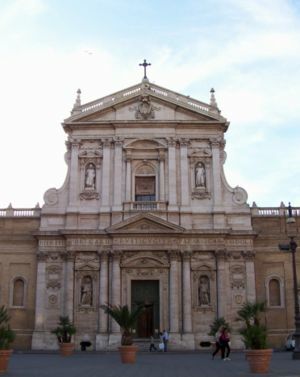 The façade of 1603 is Maderna’s masterpiece, completed five years before he began the façade of St. Peter’s Basilica. It has two stories, the lower in five tiers and the upper in three. All the elements are arranged so that they point to the center, where there is a loggia in the upper level. This is one of the finest examples of a fully-developed Baroque façade, marking the transition from Renaissance to Baroque, via Mannerism. Inside, note the chapel of St. Lawrence which contains relics of the martyr St. Genesius, the patron saint of actors (he was also known as Genesius the Comedian), and possibly those of St. Eleutherina, who presented a dowry of fifty scudi to be paid every year on the feast day of Santa Susanna, to the nine best-behaved girls in the parish. Also note the Chapel of the Crucifixion, redecorated by Richard Cardinal Cushing, Archbishop of Boston and titular from 1958-1970. The crypt is on the ground level of the early church, and recent excavations have revealed the remains of a third-century tomb which may well have been that of Gabinus. The relics of Sts. Caius, Gabinus, and Susanna are reserved under the main altar; the bodies of Saints Felicity and Silenus are in the crypt. The station was formally erected by Gregory the Great and has been established as the official American parish in Rome since Pope Benedict XV (1914-1922) invited the Missionary Priests of St. Paul (Paulist Fathers) to serve here in 1922. Location: In the Largo S. Susanna, at the head of the Via Barberini, on a straight line from S. Maria Maggiore up the Via Torino.